The Earth Day Groceries project is fairly simple and the best part it is FREE! You first contact a local grocery store (or more than one) and ask if they would like to partner with you. If they agree, you "borrow" a stack of paper grocery bags to decorate with Earth Friendly messages and pictures. The week of Earth Day, you return the bags to the store and they pass them out to their customers with their groceries in it. 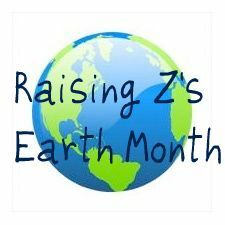 You can hang signs in your school or send out emails to your club asking that everyone shop at that store during Earth Week and the store can also hang a sign explaining the project. We also sent all of the information to the local newspapers. Make sure you take pictures during the process and then you can upload the pictures and your report to the Earth Day Groceries project website and then you are done! 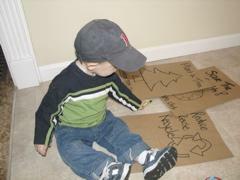 When I did this project with the MOMS club we got together at a members house for a bag decorating party. 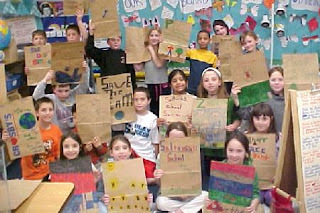 For the older children, we wrote the Earth Messages on the bags and they did the decorating. For the younger children, we drew pictures in black marker for the little ones to color. We also wrote our club name on every bag to let the community know that we were leading up this project. We all really got into and the mom's also had fun decorating bags. So go out and visit their website and see if this is something you would like to participate in. They have been doing it since 1994 :) You can participate with girl scouts, boy scouts, playgroups, after school programs.....just about anybody! I will be having a fun Earth Month giveaway tomorrow :) Make sure you come back to check it out! Great activity. I don't know that you are a teacher, little world. This is a fantastic idea! Thank you so much for sharing! I can't wait to do this in my class! That is a great idea. Thanks for taking the time to post it!